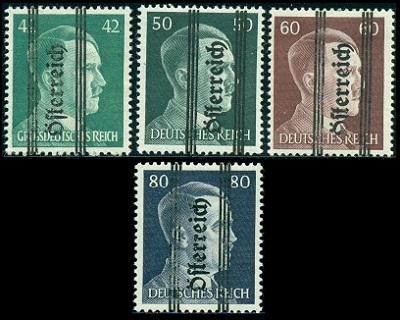 Austria stamps continued to re-appear during May and June of 1945. One thing the new provisional government in the Soviet occupation area of Eastern Austria needed desperately was a working postal service. 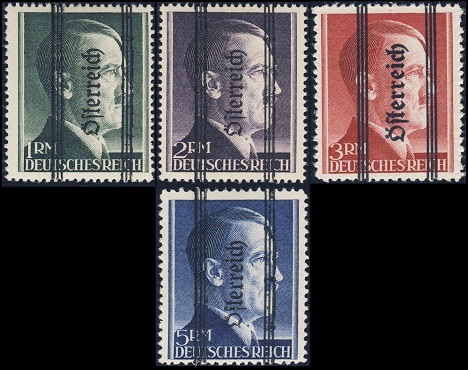 At the end of the war, the one thing in abundant supply in Austria was a very large inventory of unused Third Reich definitive postage stamps, especially those featuring the portrait of Adolf Hitler, and the new occupation government made full use of them in the ensuing months! 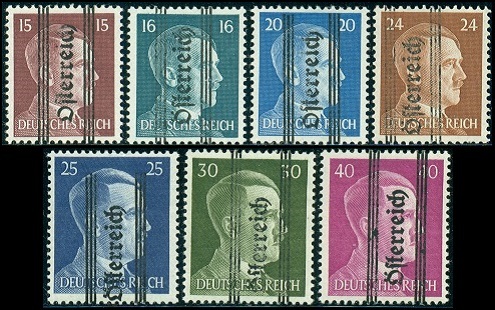 The nineteen Soviet occupation Austria stamps shown above (Mi. #674-92, Sc. 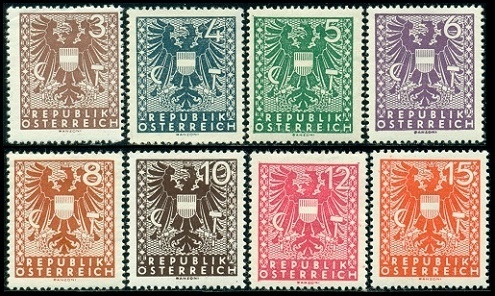 #405-23) were overprinted, for use in Styria, during May and June 1945. 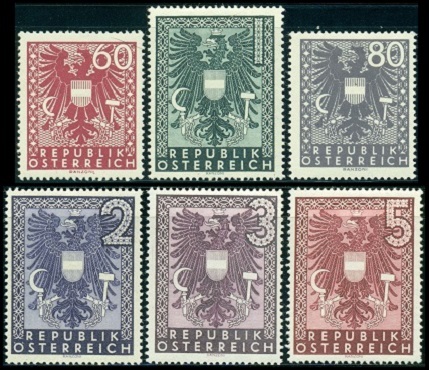 This group of overprints is known as the Graz Issue. These stamps were a local issue for the Soviet Army, used during their temporary occupation of the province of Styria. Only one type of overprint was used for these lower denomination stamps, that being Type I - Österreich is in thicker letters and is 18 1/2 mm long. were issued in June 1945. There are two types of the overprint on these stamps. Type II - Österreich is in thinner letters and is 16 1/4 mm long. (Mi. #693II-96II, Sc., #428-31) The Type II overprints are a bit more expensive than the Type I overprints. The 1 Mk. and 2 Mk. 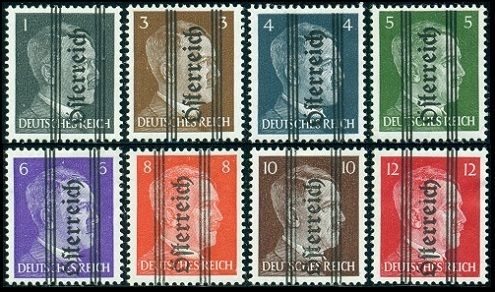 denominations, with the Type I overprint, exist perforated 12 1/2 and perforated 14. The twenty-three new Soviet occupation stamps shown above (Mi. #697-19, Sc. #432-54) were issued between July and November 1945, for use in Vienna and the Soviet occupied provinces of Lower Austria, and Burgenland. 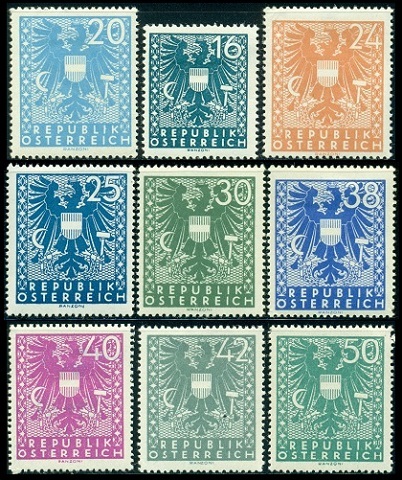 The designs feature the Austrian Eagle, and the stamps are inscribed "REPUBLIK ÖSTERREICH". There are quite a number of different shades in these stamps, and there are also many collectable plate faults of interest to the specialist. The surtaxed 1 Mk. + 10 Mk. denomination pictorial charity stamp shown above (Mi. #720, Sc. #B165) was issued on September 10, 1945. The surtax was for public welfare. The design is an allegorical representation of "The Dawn of Peace", and it features a dove of peace at the top, and an Austrian, returning to his Alpine home.